Recently, the Toronto Star ran an article with the headline “19 of Toronto’s 20 dirtiest subway stations are on the Bloor-Danforth line”. One could (mis)read that as implying that the BD line is some sort of cesspool of poorly maintained stations, while the YUS is a sparkling beacon. There is also an unfortunate echo of arguments made by some that the BD line gets second class treatment because of the people it serves. 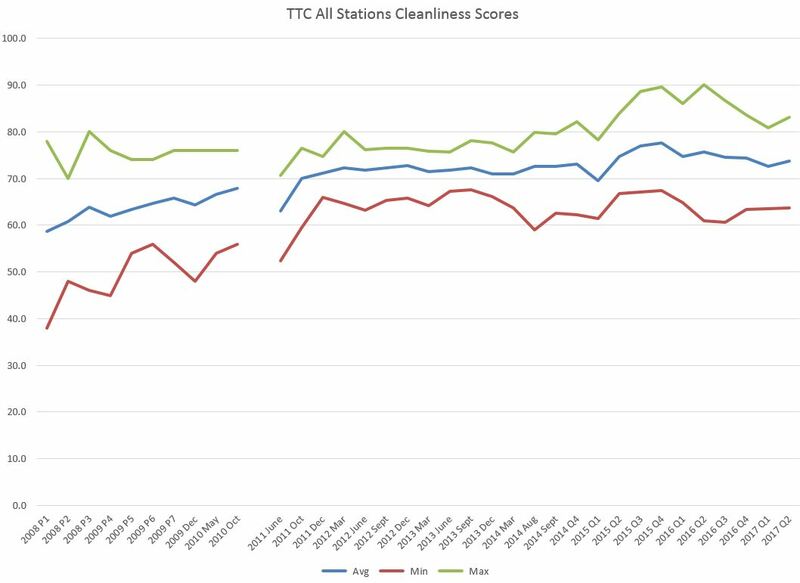 Intrigued to learn what the details of station cleanliness scores actually looked like, I asked for a copy from the TTC, and this was provided by Stuart Green, a sidekick in TTC Communications of the better-known Brad Ross. You will see an obvious upward trend globally, notwithstanding a few peaks and valleys. Andy [Byford] has made station cleanliness a priority and our customers have noticed. Our modernized station management model and the hard work of our frontline janitorial staff are making a tremendous difference. 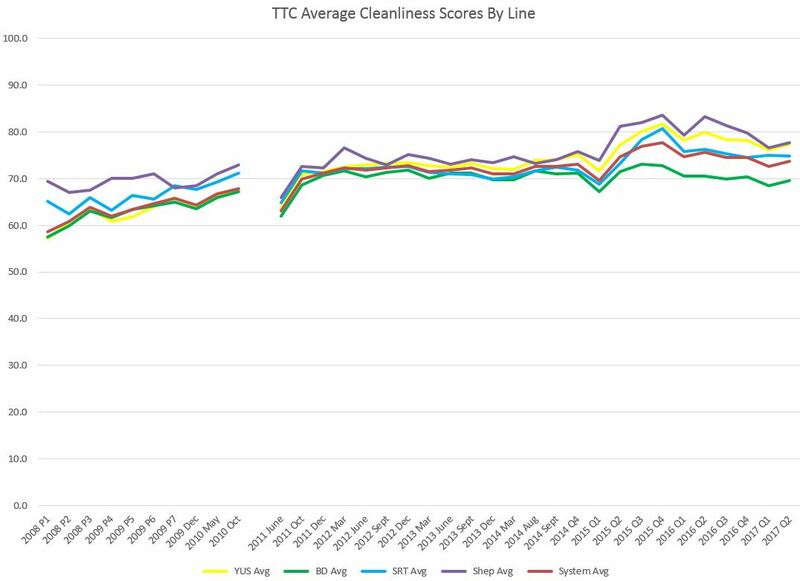 In a subway environment, the TTC is one of the cleanest systems in the world (just visit NYC). Our customer satisfaction surveys also reflect customer appreciation for just how clean stations – and vehicles – are today over five years ago. FYI, we are also in the process of procuring new equipment which can blast clean the terrazzo surfaces with much better results (see attached pic). The rating criteria is established by the TTC and provided to our external auditors. The scoring for each component (glass, metal, platform edge markers, elevators etc) is rated on a low-high scale of 1-5. The auditors assess the cleanliness of the components based on the criteria listed in the contract and scores it accordingly. The audit report takes the score for each component and averages them together to come up with a station score. Components of the stations are also averaged to see what specific items are problematic in a station. The data are revealing when they are split apart in various ways. First, the system average scores including the maximum and minimum values attained in each survey by individual stations. As Green notes, there is an upward trend, although it stalled for a considerable period from 2012-14, and after an improvement in 2015-16, values fell again in 2017. Quite clearly there was a wide range of scores back in 2008 when this process started, but a lot of the improvement over early years was to pull up the bottom performers (thereby increasing both the minimum score and the average). The maximum score did not start to rise substantially until 2015. The gap for the first part of 2011 was caused by a change in the contractors doing the condition surveys. It is intriguing that the first results from the new contractor showed a dip in values although this was quickly reset. Whether this was due to a change in TTC practices, or a re-calibration of the survey is hard to know. There is a marked improvement starting in 2015, although more so in the maximum values. Much of this improvement fell away by 2017. The biggest jump for 2015 came on the Sheppard line with Yonge a close second and then the SRT. What is quite striking is that the improvement had little effect on the Bloor-Danforth line. Another factor that stands out here are dips in Q1 of recent years probably due to winter conditions. This could well be a function of when the surveys were done as past years show data explicitly for December and March, but not for January or February. From 1861 to 1891, the Toronto Street Railway Company (TSR) operated a network of horse car routes serving the then small City of Toronto. By the end of the TSR franchise, the City was eager to see the new railway electrification technology replace the horses, and granted a 30-year franchise effective September 1, 1891, to the Toronto Railway Company (TRC) with the express requirement that electric operation begin within a year. 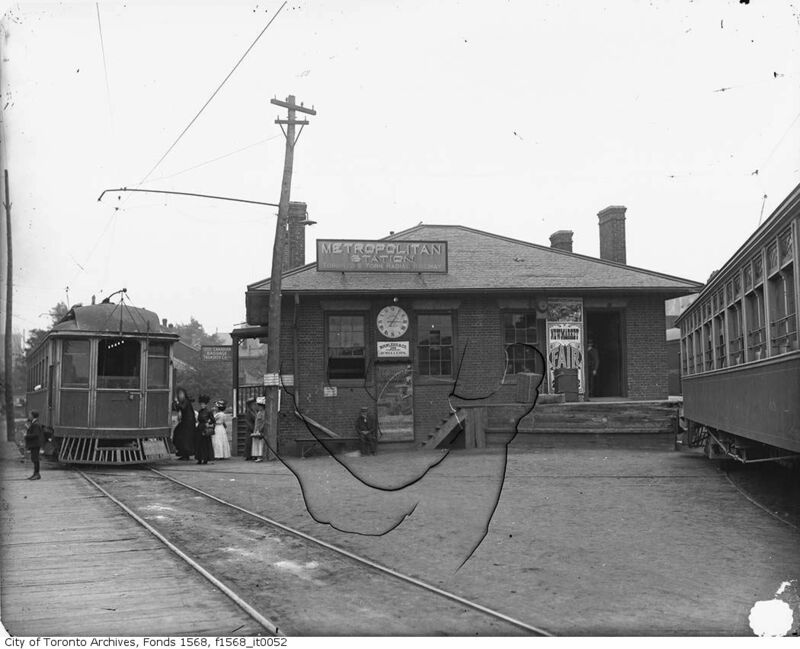 August 15, 1892 saw the official first run of an electric streetcar on the TRC’s Church Street route (Union Station to Rosedale), and revenue service began the day after. In keeping with the terms of its franchise, the TRC beavered through electrification of the horse car routes, and the last of these (McCaul Street) ceased operating in August 1894. Electric service began on this route in December 1894 completing the conversion of the system. There was money to be made from street railways and related businesses including power generation. Niagara power would not reach Toronto until 1907, and until then the railway companies had to generate their own. It was no coincidence that ownership of the street railways and electric light companies were related. The TRC’s operations were based out of many buildings near Front and Sherbourne, and several of these had been taken over from the predecessor TSR. The requirements of an electric railway were quite different from those of a horse car operation, and over time buildings were repurposed or rebuilt. Only one building remains on the southeast corner of Front and Frederick, and it is now the Young People’s Theatre. This began life as a TSR stable in the 1880s, but was converted to a power house with steam generation by the TRC. 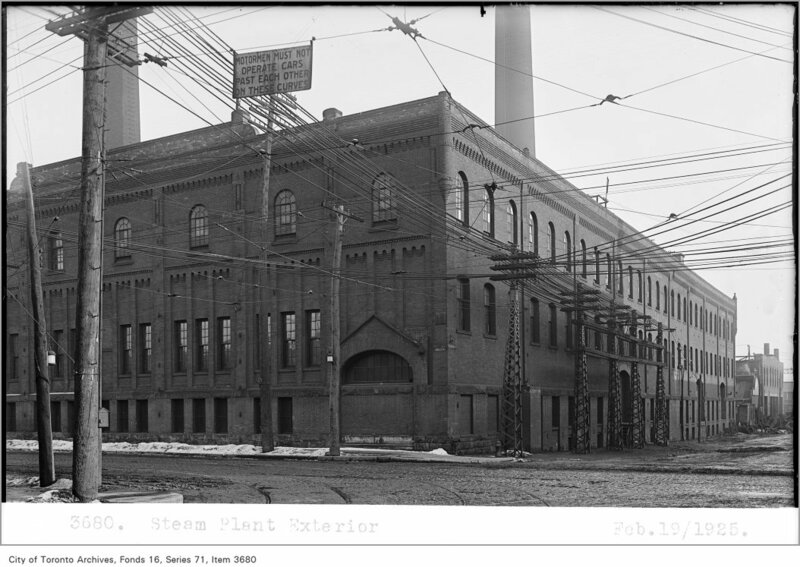 Even after hydro-electric power arrived from Niagara, this building remained as a standby facility thanks to the unpredictable supply. It was decommissioned by the TTC in 1924. 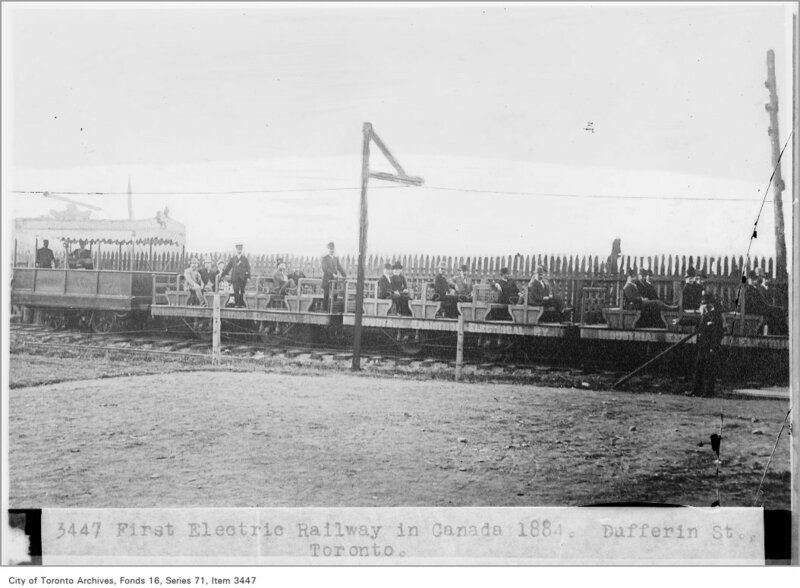 Although August 15 is the TRC’s 125th annniversary of electrification, this was not the first such operation in Toronto. Updated August 16, 2017: Based on information from John F. Bromley (see the comments), the first year of operation for this line was 1883, not 1884. During that first year, the line ran with power from a third rail, but from 1884 onward from overhead. The text below has been modified to reflect this timeline. 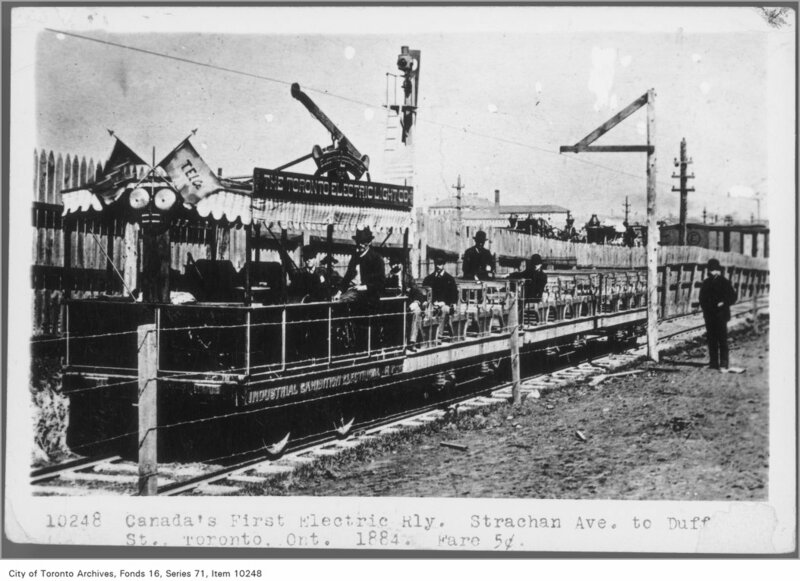 From 1883-1891, an electric railway operated from Strachan Avenue to Dufferin Street in the Canadian National Exhibition grounds, then known as the Toronto Industrial Exhibition. The line was a demonstration by J.J. Wright of the Toronto Electric Light Co. and Charles Van Depoele, described in the archives as “a Belgian-American street railway promoter”. For the first year, the line ran with third rail power, but from 1884 from overhead wire and a pole pickup that showed more promise for street operation. The line was seasonal and ran only during the CNE linking the grounds with the horse car service on King Street. The fare was a princely five cents, separate from the TSR. 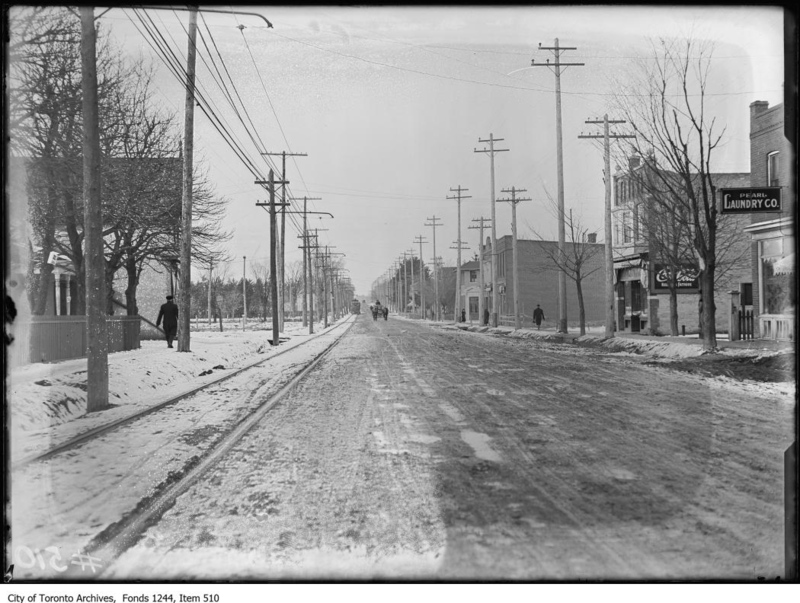 The next electric railway operation in Toronto was out in what were then the suburbs of Deer Park, Davisville and Eglinton. The Metropolitan Railway Company (later the Metropolitan Division of the Toronto and York Radial Railway Company) operated a horse car line from the then northern City limit at the CPR tracks (where North Toronto station now stands) to Eglinton starting in January 1885. This was extended to Glen Grove in 1886 where the Metropolitan’s owners built a “Park and Pleasure Ground”, an early example of street railways creating demand by building destinations. 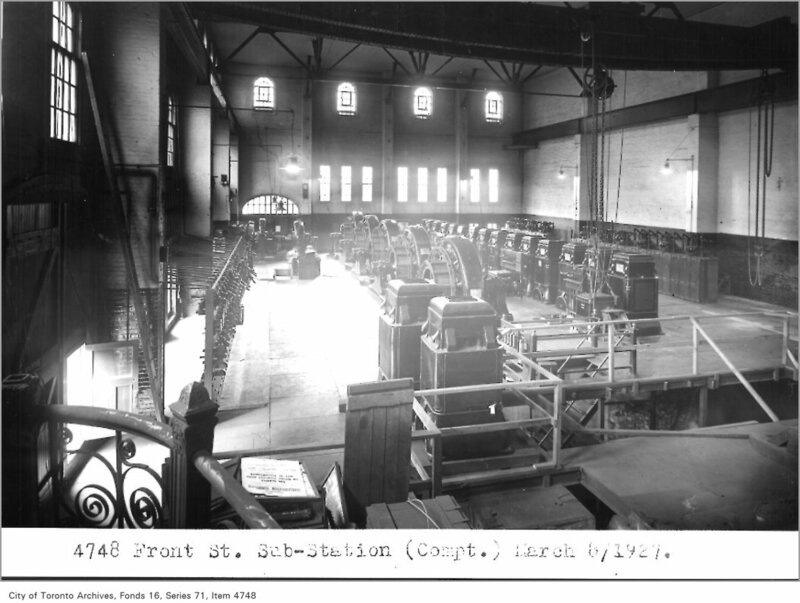 The demonstration at the Industrial Exhibition and electrification of other networks (Windsor, Ontario in 1886; an interurban line between St. Catharines and Thorold in 1887) prompted the Metropolitan to pursue electrification in Toronto. The first electric car ran on September 1, 1890, with power coming from a steam plant at Davisville. Early operations were less than ideal because the horse car track was not up to the weight of the heavier electric cars, and electrical bonding of the rails was poor. These problems were ironed out in the first year’s operation, and pressure for expansion northward quickly followed. By 1892 the line ran to “York Mills South” at what later became Glen Echo Loop, the northern extent of the TTC’s “city” network after it took over operation north of the CPR tracks. The line would eventually reach Sutton at Lake Simcoe. The fare boundary at the CPR between the TSR, later the TRC, and the T&YRR was an annoyance quite reminiscent of complaints we now hear at Steeles Avenue. The TRC sped through its electrification program in three years and continued to expand the system, but there were troubles ahead. Investments with decades to pay back and a growing population to support the railway were one thing, but as the franchise ran on, the TRC refused to expand beyond the City Limits as they were in 1891. This led Toronto to build the Toronto Civic Railway with lines in newly annexed areas such as the Danforth, St. Clair and Bloor West. By 1921, the City had no appetite for another private railway company, and it formed the Toronto Transportation Commission to consolidate all of the operations within the City. That centenary is four years and many articles away. Street Railways of Toronto 1861-1921, Louis H. Pursley, Interurbans Special 25, June 1958. The Toronto Trolley Car Story 1921-1961, Louis H. Pursley, Interurbans Special 29, June 1961. Riding the Radials, Toronto’s Suburban Electric Streetcar Lines, Robert M. Stamp, The Boston Mills Press, 1989. From time to time, readers mention in comments the common delays at Spadina Station caused by the manner in which streetcars unload and load at the platform. Before the introduction of the new Flexitys, cars would enter the station, unload at the east end of the platform, then pull ahead to load at the west end. There was even enough room that three cars could be on the platform at once with one ready to move forward into the loading zone as soon as room was available. However, with the longer Flexitys, two cars will not quite fit on the platform, and although there are still separate unloading and loading stops, in practice only one car can be on the platform at a time. When this is compounded with delays for crew changes and with the siestas some cars take while loading, delays to passengers waiting to get off of arriving cars are chronic and lengthy. I asked the TTC’s Brad Ross why cars did not make better use of the space. An option that comes up is for the loading car to pull slightly beyond the platform and not open its front-most door. This would allow the following car to come fully onto the platform and unload. The front of the loading car would not be in the tunnel itself, but adjacent to an unused area of the platform at the west end. It is not possible to isolate the front doors of the LFLRV. If the streetcar were to go past the glass barrier to allow a second streetcar to access the platform, we would not be able to open the remaining 3 doors, while keeping the first door closed. All doors would closed but enabled, and would require our customers to push the door button to gain access to the streetcar. In addition, we would not be able to prevent anyone from opening the first set of doors from the inside of the streetcar (or even from outside, should a customer go around the glass wall and push the button). This is a huge safety issue, as the front doors are not flush with the platform at that position, and customers would have to step down to the rail bed. One obvious solution would be to extend the platform so that it does sit flush with the front doors, but that is not an option at this point. The issue actually lies with the structural pillars that support the station; they are too close to the streetcar to allow proper egress. This is where I am seeking clarification from the Construction group. I am unsure of which pillar is in the way and what the actual requirement is, but have heard that it would cost millions to relocate the pillar to allow us to extend the platform. That is why that section of the platform is not being used and the glass partition is in place. This begs the rather obvious question of why it is not possible for an operator to selectively open doors on a car. It is not unknown for vehicles to be in locations where a physical barrier would prevent use of all doors. In the specific case of loading at Spadina Station, the loss of the comparatively narrow first door would be a good tradeoff for simply getting a car far enough into the loading area that its follower could unload behind it. I await further feedback on the matter of the cost and practicality of modifying the station, but in the meantime, it is useful to look at this problem in the manner we normally see for evaluations of expensive rapid transit projects: the value of riders’ time. Billions in spending on rapid transit has been justified by the premise that people will move more quickly and thereby save time, time that has a value against which the capital investment can be offset. There are 15 cars per hour attempting to serve Spadina Station. If we assume that each car is delayed by an average of 2 minutes, and that it has an average of 50 passengers, this translates to 1,500 minutes of passenger delay per hour. If this condition persists on average for 8 hours per day, that means there are 12,000 passenger minutes of delay, or 200 passenger hours. The value of riders’ time is often quoted at about $30/hour, and this means a value of lost time of $6,000 per day. Scaling up to a year with a 300:1 factor (counting weekends as one day) gives us an annual lost time value of $1,800,000. It is self evident that any of the variables used here can be tweaked up or down, but this gives the general idea of how the calculation would come out. Of course the City cannot “spend” that $1.8 million to offset reconstruction at the station because it is not real money, as I’m sure we would be told by the financial boffins. In addition to any notional saving that riders might obtain, there is the real cost of, probably, one extra car on the Spadina route thanks to the extra running time needed to serve Spadina Station Loop. There is a real need for the TTC to sort out operations at Spadina Station to minimize delays. This should include both figuring out how to use the loading area with a car projecting slightly beyond the platform and ensuring that crew changes happen as briskly as possible. I will update this article when/if more information becomes available. Based on Twitter feedback, a few comments are in order. In this article, I did not refer to explicit methods of crewing, but used the term “drop back” on Twitter. Some took umbrage saying that the term is “step back”. In fact both terms have been used over the years. It is the mechanism that counts, not the name. The idea is that operators get a break without the car having to sit there while they take it. To do this, there are more operators than cars, and an operator from car “n” “steps back” to car “n+2” (or whatever) so that they get a break of, in theory, two headways (the number can vary depending on how long a break is desired). This works fine as long as the operator who is supposed to take over an incoming car is actually available when it shows up. At a location like Spadina Station, there is no stacking space to accommodate late crew changes whether they are part of a step back system or a regular shift change, and the problem can be compounded when the home division for the line is a long way away, and operators have to travel to pick up their cars in service. Delays of cars getting on to the platform because of the loading techniques just make this worse by holding cars in the tunnel. Everyone involved – TTC management, planners, line supervisors and operators – need to work together to find a way to improve operations at this busy station which have deteriorated noticeably since the new cars were introduced. The principle of “value of riders’ time” is often used to justify big ticket capital projects, but it does not have the same clout in day to day operations. In his continuing program of bribing the electorate with promises that the City cannot afford, Mayor Tory has asked the TTC to bring forth a 2018 operating budget containing no fare increase. This would come, of course, just in time for his re-election campaign where Tory could brag about all the transit wonders he has bestowed on our fair city. Fare freezes are simplistic approaches to a “transit policy” not unlike fantasy subway maps and promises that tax increases will be held at no more than inflation. Can’t fit it all into the budget? There must be efficiencies, cost cutting that will solve problems, because as we all know public agencies like the TTC are rife with fat just waiting to be trimmed. That’s a great story, and it plays to the wing of Council whose only concern is to be re-elected for keeping taxes down. The reality is not quite what it is made out to be. TTC faces a shortfall in its budget for 2018 thanks to increasing costs and expansion of its subway service. The degree of this shortfall has probably been understated. There is no provision for improved service (net of the subway extension) because ridership is expected to remain fairly static. The cost increases cannot be wished away with an appeal to make the TTC more “efficient” both because of their scale, and the many cuts that have been made in recent years responding to subsidy constraints. Several projects-in-progress are expected to bring efficiency savings to the TTC in future years, but not in 2018. Moreover, some “savings” are really an ability to do a better job with existing resources, not to cut costs. “Fare equity” means different things to different people, and can be argued from viewpoints that trigger quite different outcomes. “Poverty reduction” is a key strategy for City Council, but much more as a talking point than a real, financial commitment. TTC fares are part of this strategy, but there is a danger this will get lumped into overall transit costs rather then be recognized as a need for dedicated, separate funding in the City budget. The inherent economic value of simply having good transit service at an acceptable price rarely enters the discussion even though billions in tax revenue and development opportunities hinge on transit’s existence. Policy discussions consistently avoid complex issues regarding fare discounts and service quality, and there is little understanding of the menu of options available should Toronto and the TTC choose to pursue them. As in so many past years, the TTC enters its budget cycle in crisis mode – how will we find all the money – having studiously avoided the details of its budget and of revenue options. Perish the thought that the TTC might actually suggest or even advocate for new fare and service policies without first getting the Mayor’s blessing and staging a press conference to announce his decision. The September 2017 schedule changes primarily involve the reversal of summer service cuts to many routes with only minimal service improvements. This continues the TTC’s policy for 2017 of constraining service growth in the face of lower than budgeted ridership, as well as the shortage of vehicles. Streetcar service is restored between Russell Carhouse (at Connaught) and Sunnyside Loop. This will be affected in October when the intersection of McCaul and Queen is rebuilt requiring a diversion. A bus shuttle will operate from River to Neville Park due to the reconstruction of the intersection at Coxwell and Queen. This will also require the continued operation of buses on the 502/503 services on Kingston Road. Through streetcar service to Neville Park will resume with the October schedules. A bus shuttle to Long Branch will operate from Dufferin Loop, and Marine Parade will be served by its own local shuttle to Windermere. Construction on The Queensway will prevent streetcars from operating to Humber Loop until the end of the year. Streetcars will not operate west of Humber Loop to Long Branch until mid-2018. With the return of ALRVs to the Queen route, 504 King will operate primarily with CLRVs, and the peak period trippers will mainly be buses, not streetcars. The effective capacity of the route will fall because of the lower capacity of CLRVs and buses versus the streetcars that have been used over the summer of 2017. This will be minimally offset by a small reduction in headways during all operating periods thanks to trimming of the running time. King cars now enjoy extended layovers leading to queues of vehicles at terminals thanks to an overly-generous schedule. The number of streetcars in service remains the same, but on slightly shorter headways. New low-floor Flexity streetcars will be deployed on 512 St. Clair starting in September, subject to availability. The schedule will be based on CLRVs until new car deliveries reach the point where the line can be scheduled as a Flexity route. The TTC plans to begin using Flexitys on 504 King late in 2017 subject to availability. Between them, the King and St. Clair routes require about 60 CLRVs at peak. Allowing for some capacity growth with Flexitys, this translates to about 45 of the new cars, plus spares. It will be some time before both routes are converted, assuming Bombardier achieves their ramped up delivery rate in fall 2017. They are already slightly behind schedule with only two of three planned cars for July 2017 out the door in Thunder Bay, and they have not yet implemented the additional shifts/workforce to produce cars at a higher rate effective October 2017. The northbound stop at Broadview & Danforth will be removed allegedly in the aid of transit priority signalling. In fact, this is a location where the substantial green time afforded to east-west traffic on Danforth makes the idea of “priority” for transit movements difficult to swallow. There is already an advanced green northbound for left turning motor traffic. Given the layovers now enjoyed by streetcars at Broadview Station, it is not clear just what this priority will achieve, but removing the stop will annoy the many riders who now use it. The southbound stop remains in service. 54 Lawrence East: Water main construction west of Victoria Park has completed. Renforth Station opens: 32 Eglinton West and 112 West Mall are rerouted into the new regional terminal. Kennedy Station: The schedule change to accommodate Crosstown construction is implemented for weekend service on 86 Scarborough. Long Branch Loop: All buses will loop via the streetcar loop during reconstruction of the bus roadway. 123 Shorncliffe: Additional running time to accommodate a City paving project. 506 Carlton: The only remaining construction area/diversion is on College between Bathurst and Lansdowne. This will end in October. 505 Dundas: The diversion between Bay and Church will end in late September or early October depending on progress of the road works east of Yonge. The 400 Lawrence Manor and 404 East York Community Bus services will be extended. For details, see the TTC’s July 2017 update on these services.